Let’s celebrate diversity!! We need it now more than ever. Do you have any traditional dishes that you can share with us? Or maybe some childhood food memories to share? Recipes from all over the World are more than welcome. Inheritance Recipes is a challenge that Solange of Pebble Soup and I have started to celebrate dishes food bloggers cherish. Recipes which have been passed down by a family member, a friend, through an ancestral culture and dishes which you would like to bestow to future generations. Each month food bloggers from all over the world will add their favourite recipes celebrating their roots. That way we’ll end up with the most diverse round-up of all round-ups. – dishes inherited from a family member or a friend. We will share your recipes via our social media channels and include in the round-up. We will also add your recipes to the Inheritance Recipes Pinterest board (that has over 3,8 K followers) and include your blog’s handle in our Inheritance Recipes list on Twitter that we use to retweet on daily basis. Please note that entries that fail to follow instructions won’t be approved. 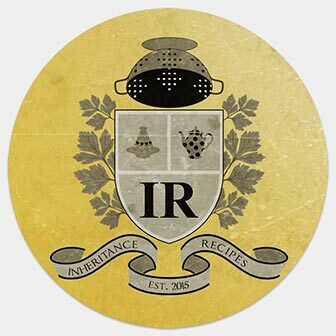 Use #InheritanceRecipes hashtag for your entries across social media and we will re-share them whenever possible. When you have a spare moment do visit other entries that caught your eye, comment on them and give them some social media love. Please, click through to open one of the badges, right click to save it to your computer and then upload badge to your blog, please do not hotlink to images on our server.